A few weeks ago I went on a little outing to the beach. I remember writing about a year ago that I didn't like the beach, that I wasn't a 'beachy' person. For some reason, I felt bad writing that, as if I hadn't given the beach a fair go. Is that strange? Anyway, I decided to give going to the beach another try. 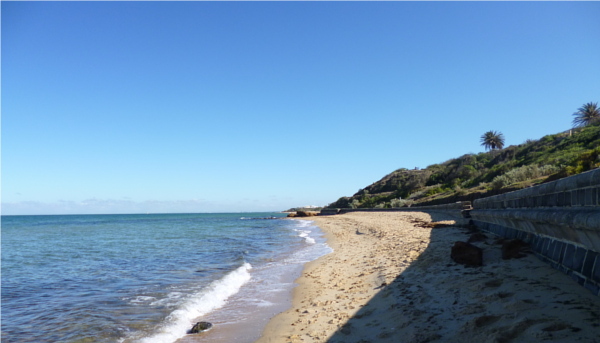 After looking up an article on the best beaches in metropolitan Melbourne, I chose Sandringham beach. 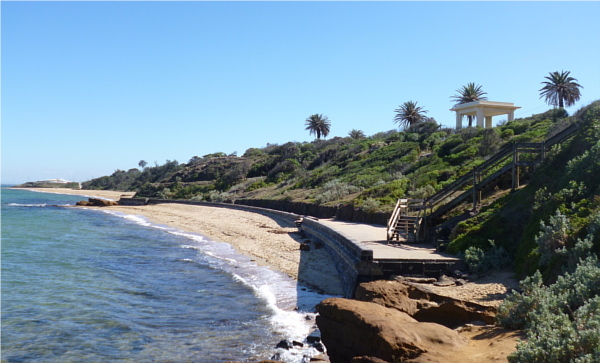 It's very easy to get to on the Sandringham train line, about 25 minutes from the city centre. The beach is only one block from the train station. The article said that the most popular part of the beach is the Northern area, so of course I turned South for my walk. It was very difficult walking along the sand and I had to stop quite a few times to rest my legs. The few other people I saw powered along at twice my pace, so perhaps it's something that gets easier with practice. 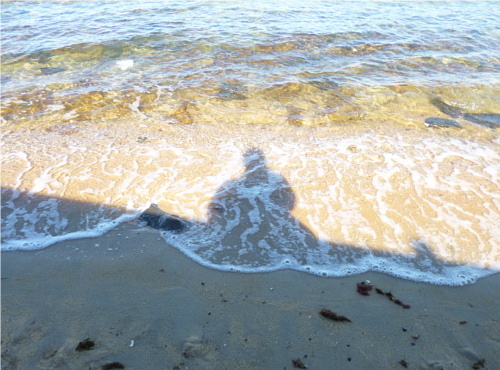 It was when I stopped walking though, that I started to realise the magic of the beach. Always when I come to the beach, I like to imagine the vastness of the ocean and the immense distance to any other land mass. Looking out into the distance is like a meditation, calming to the mind. 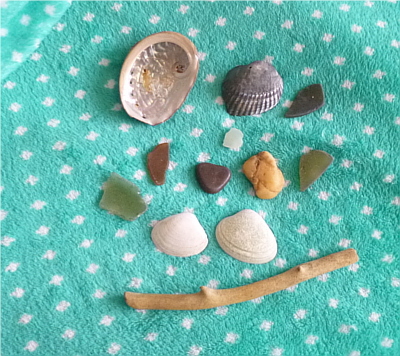 I also spent some time looking for shells and anything else I could find. I even found some precious sea glass! 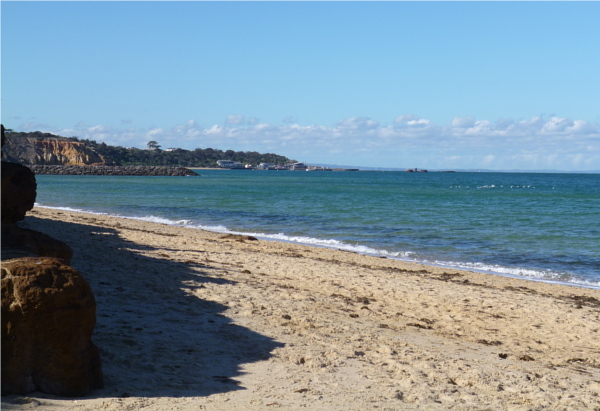 Aside from that, I was impressed at how clean Sandringham Beach is. 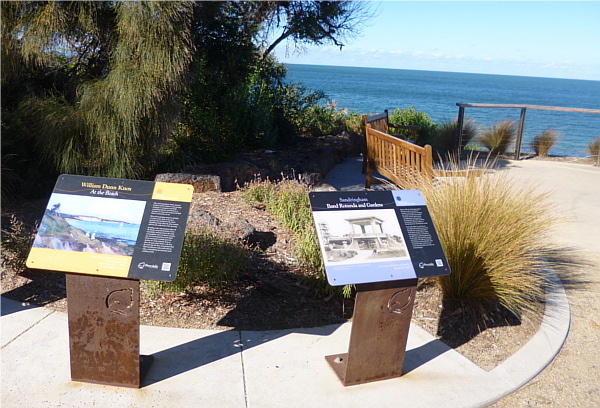 The cliffs are beautiful and have been the subject of many paintings over the years, as this display at the entrance to the beach shows. I've changed my mind about the beach, and I think it's because I've realised that you don't have to do anything while you're there. Ever since I was a little girl, trips to the beach were always long journeys that meant hours in the car. Even now, takes me over an hour from where I live to get to the nearest beach. The mind tends to assume that you have to make the most of your time while you're there, cram in as many activities as you can. But when you let go of all that and just experience it -- that's when the beach is at its best. I wish I'd taken a photo of my outfit that day. I wore my newly-finished blue shawl and crocheted necklace. I used to do "What I Wore" drawings to capture outfits I particularly liked. As well as good drawing practice, they enabled me to show outfits while avoiding showing photos of myself. At some point though, I stopped finishing them, or I would list the items I wore to draw later and never got around to it. The obvious solution is just to take a photo, but I'm too self-conscious. I want to start working on that aspect of myself. And I do want to return to the beach again one day. I'm glad you changed your mind about it, Australian beaches are just gorgeous! And it's the same way I feel about going to the beach, too - it's one of those rare places you go to do exactly nothing :) That mother of pearl shell is just wonderful, too! It was much more beautiful than I expected, I have to admit. The mother of pearl shell was my best find! I want to make it into a necklace.